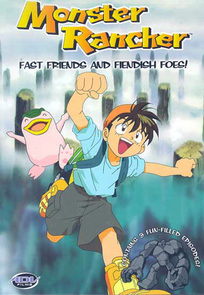 Title: Monster Rancher - Fast Friends and Fiendish Foes! At last we meet the evil Moo! Now aware of Genki's plans to stop him, Moo orders the powerful Pixie to send her gang of black hares after Genki and his friends! Then our heroes discover the secret behind Holly's magic pendant and the terrible history of Moo's very first attack! Genki and the group must work together to build an Iron Bird to fly over the bottomless Heaven's Canyon and escape capture from Captain Kudo's fearsome army! Get ready for the most exciting Monster Rancher Adventure yet!